Samsung Galaxy Music Duos S6012, a smart phone by Samsung was announced in October 2012 and is expected to be released really soon. 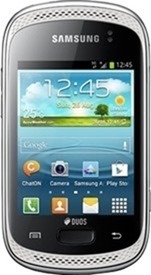 Galaxy Music is a portable and compact phone by Samsung with touch screen capabilities and many other amazing features. Here’s a look at what you can expect with the Samsung Galaxy Music Duos. Galaxy Music supports 2G (GSM), and 3G (HSDPA) networks. It is a dual SIM phone, but the SIM required to operate in Galaxy Music is a mini-sim. Galaxy Music is a small touch-screen phone with a curved body. Its dimensions are 4.33 x 2.32 x 0.48 inches and weighs 107g which makes it a light weight cell phone as well. Galaxy Music has a multi touch TFT capacitive touchscreen of 3.0 inches with 240×320 pixels and 256K colors. This is a perfectly fine display for a touch phone that is small and light weighted like the Galaxy Music. Galaxy Music comes with a 512MB RAM and a 4GB internal memory. It also has a MicroSD slot which allows the user to expand the memory if they want. The MicroSD can support memory card up to 32GB. Galaxy Music has all the data and connectivity options a smart phone should have such as GPRS, EDGE, WLAN, Wi-Fi Hotspot, 3.0 Bluetooth, and a 2.0 USB. Galaxy Music has a 3.15MP camera with 2048X1536 pixels. The camera features touch-focus and geo-tagging. The camera of Galaxy Music also has the ability to make videos. It does not have a secondary camera, but has a photo editor and a photo viewer to view and edit the pictures captured from the camera. Galaxy Music has both MP3 and MP4 players to allow its users unlimited high quality music and high definition videos. Galaxy Music is an Android phone. It has Android Ice Cream Sandwich V4.0.4. which can be upgraded to Jelly Bean V4.1. It has a 850 MHz Cortex-A9 CPU. It has three different kinds of sensors: Accelerometer, compass, and proximity sensors to allow its users accurate, perfect, and uninterrupted use. It also supports messaging as SMS (threaded view), Push Mail, Instant Messaging, Email and MMs as well. It has a HTML5 browser to allow its users to enjoy unlimited and fun-filled web surfing on their cell phone. It also has Java MIDP emulator to make the gaming experience better. It has a stereo FM radio with RDS and built-in antenna. It also has other features such as organizer, document viewer, voice memo, voice dial, and predictive input text which are necessary features that every cell phone should have. It also has SNS integration. It comes with a bunch of pre-installed apps such as Google Talk, Google Maps, Gmail, Google Search, YouTube, Picasa, and calendar. Galaxy Music will be available in blue, orange, and grey colors. Author Bio: I am John S Lam from Test4Prep; it gives 100% 640-802 test. Let’s take benefit of 640-822 test material efficiently and get guaranteed success. Check out free demo of all certifications Exam.